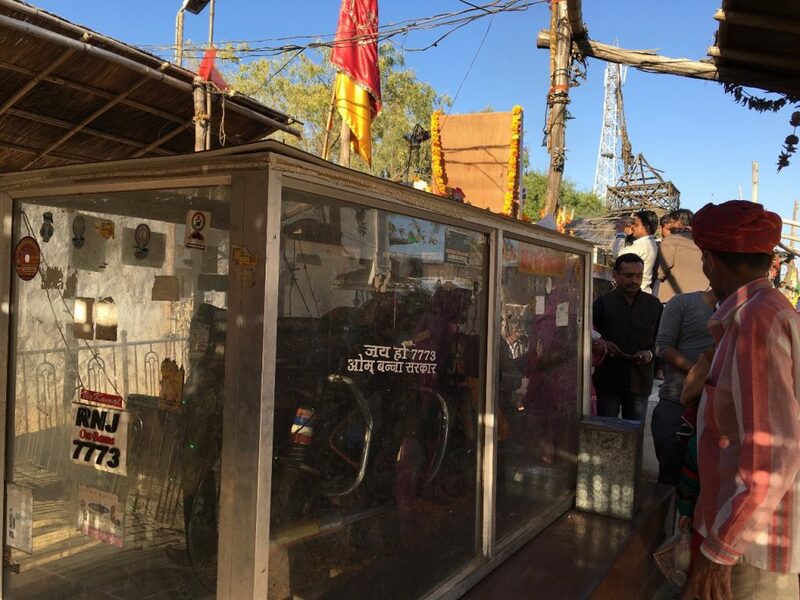 Located just off NH-65, a few kilometres from the city of Pali on the Pali-Jodhpur highway in Rajasthan, is one of the most unusual temples of its kind in India. 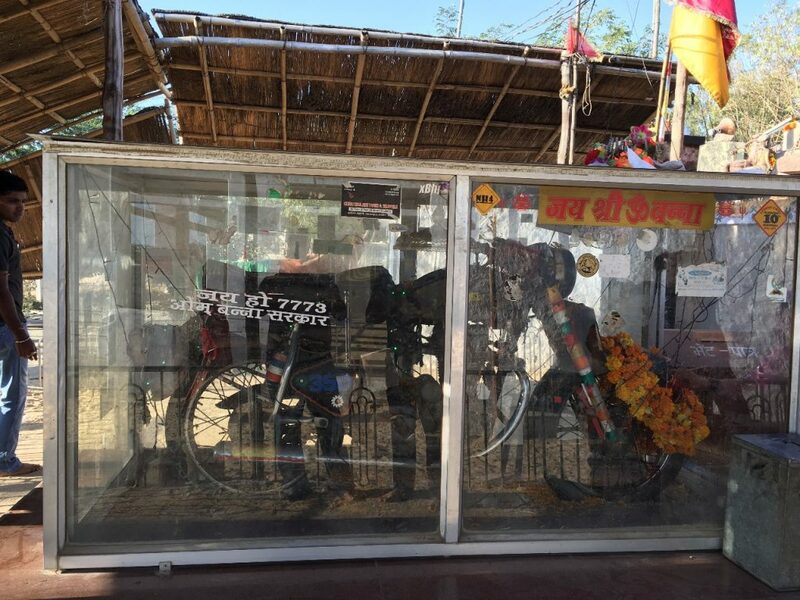 A Bullet Baba Temple dedicated to a motorcycle and its rider; a pilgrimage for every Royal Enfield rider. Om Banna, aka Bullet Baba. The legend goes that Om Banna, a local, died in an accident when his motorcycle crashed into a tree. The Bullet he was riding was taken into police custody. The next morning, however, it was found under the same tree where the accident had occurred. Initially thought to be a prank, all attempts to seize the motorcycle failed as it kept returning to the same tree. 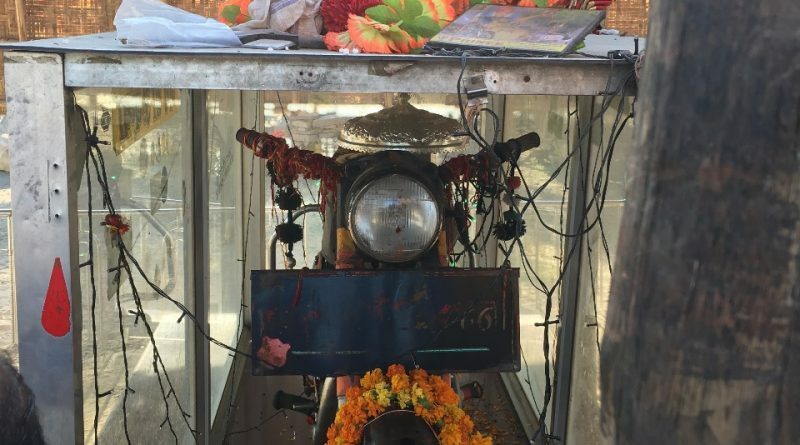 The locals believed that the bike had supernatural powers and built a shrine at the spot. 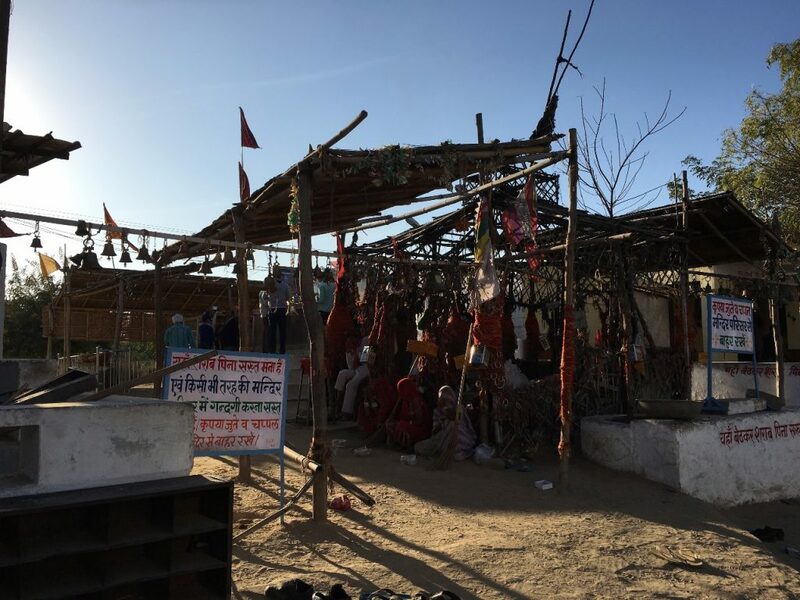 Visiting Bullet Baba Temple was on my bucket list for some years, even before I owned my RE. It was the winter of 2015; my friends and I were on a road trip across Rajasthan. We were exploring the Kumbhalgarh fort and plotting our route to our next stop Jodhpur, when I noticed that the GPS would lead us past Pali. The legend came back to memory, and I insisted that we stop at the shrine if it fell on the way. 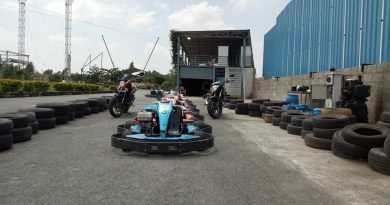 I vaguely remember rushing through lunch and insisting that we start for Pali as early as possible. The road from Kumbhalgarh was a State Highway that was broken, battered and densely trafficated with crazy trucks and cows in equal measure. The GPS (Google Maps, you still haven’t learnt your lesson) led us through a number of small towns and settlements whose residents stared at our cars in awe, and smiled, knowing how lost we are. We pulled over at the side of the highway and even before my friends had gotten out of the cars, I had already taken off my shoes and entered the shrine. There was a small bust of Om Banna being worshipped, and the place was quite crowded with travellers. 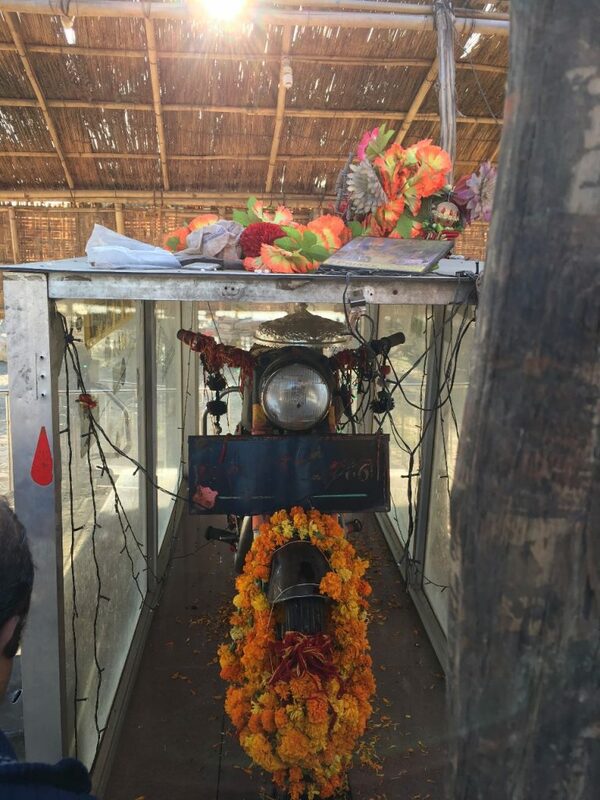 Tradition demands that all those who travel through the stretch stop and pay their respects to Bullet Baba, who protects them on the journey ahead. The entrance to the Bullet Baba Temple. 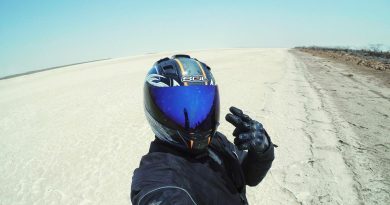 Overcome with emotion and reverence, I touched my forehead to the base of the bust, and said a small prayer of gratitude and asked for protection on the journey ahead, and for all the journeys I would undertake on my own motorcycle from then on. After finishing my prayers, we began to take in the rest of the place. The motorcycle is enshrined, protected by a glass enclosure and covered by sacred threads. Local minstrels sing hymns that leave you captivated even though you may not understand the language. I bowed my head and touched my forehead to the glass, whispering a silent prayer again. 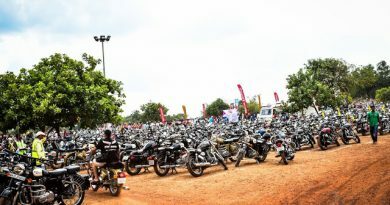 It may seem foolish to a lot of people that a motorcycle is worshipped with such reverence. The legend of the motorcycle returning to the same spot may be considered a prank. Yet, India is no stranger to such legends and stories. The sceptics will have their say, and then there will be the spirit of Om Banna, protecting travellers on their sojourns. As we left the place, I was overcome with emotion. To this day, I believe that I was blessed to have made the pilgrimage to Bullet Baba Temple. I believe that his spirit watches over me and all of us, as we embark on our journeys in quest of the known and unknown. Legend has it that one can hear the Bullet revving late at night.